Difference between revisions of "Leiden (Zuid-Holland, Netherlands)"
<em>Verhaat van 't gene verliandelt ende besloten is in de Byeenkomste tot Leyden. </em>Amsterdam, 1661. 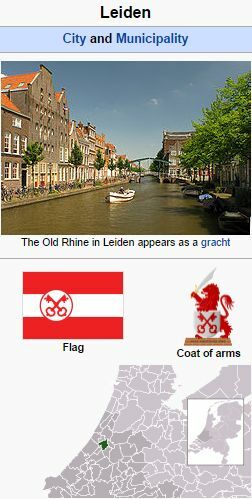 Map, flag, and emblem of Leiden. Pulpit in the Doopsgezinde Kerk, Leiden. Photo by Jelle Visser Dokkum. 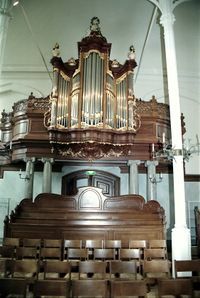 Organ in the Doopsgezinde Kerk, Leiden. Leiden, a town in the Dutch province of South Holland (1953 population, 91,632, with 626 Mennonites; 2014 population, 121,249), where Anabaptists have been found since the earliest period, who apparently at first mostly belonged to the revolutionary branch. Unemployment and poverty among the weavers, who were numerous in this city, were a fertile matrix for revolutionary teachings, which the Anabaptist elder Cornelis Pieters of den Briel proclaimed here soon after 1530. He was active in Leiden at several times. Pieter Pieters, alias Borrekieck, tried and executed at Amsterdam in July 1535, reports a number of names of Anabaptists at Leiden in 1534 who had been baptized by Cornelis Pietersz. In 1533 Jan Beuckelszoon (Jan van Leyden) lived here. In April 1534 an attack on the city was contrived but not carried out and in January 1535 a new attack was planned but prevented by treason. At that time a number of Anabaptists were apprehended and put to death. After Münster had fallen (25 July 1535) there were still some traces of Münsterism at Leiden, but gradually this declined and after a number of followers of Batenburg had been arrested in May 1544 the revolutionary Anabaptists disappeared. Apparently at that time a congregation of peaceful Anabaptists already existed, of whose earliest history not much is known. In 1544 Reyer Willemsz of Leiden is said to have circulated books by Menno Simons. There were some martyrs in 1552, and Leenaert Bouwens baptized 27 persons here in 1563-1565. About this time or shortly thereafter a number of Mennonites came from Flanders. About the circumstances of the Mennonites during the siege of the city by Spanish soldiers in 1574, no information is available. In the last decades of the 16th century the schisms among the Dutch Mennonites caused a number of different branches at Leiden also. About 1600 four congregations existed: Flemish, Waterlander, Frisian, and High German. Perhaps there was also a French-speaking Waterlander congregation. There is only adequate information. only about the Waterlander and the Flemish. In both the Flemish and the Waterlander congregations a number of names are found which show that its members were refugees from Flanders and especially from French Flanders: Christian names, such as Jacques, Gilles, Francois, family names like Hennebo, Marville (Marvilje), Tavenne, des Mulliers, du Forest, Casier (Cesaer), Le Poole, van de Walle, de Pla (le Pla), Viane, Calvaert, Bossu, le Leu, and Roynaert. Although no figures are available, it is known that the Flemish congregation was rather small. In 1626 its preachers Francois van Achterson, Joost Cassier, and Hendrick Ongena signed the Outerman confession, while in 1632 Christiaan de Koninck and Jan Weyns of Leiden signed the Dordrecht confession. This caused a schism in the Leiden Flemish congregation. A small number, following Elder Jan Rose, separated from the main body and did not return before 1663, after Rose had died. In 1639 the Frisian congregation, which had been joined by a number of High German Mennonites, merged with the Flemish church. In 1660 an old people's home, called De Hoeksteen, and intended for aged women of the congregations, was founded on Het Levendael. The congregation was conservative and a champion of strict Mennonitism. In 1660 together with the congregations of Rotterdam, Dordrecht, and Gouda, it arranged a meeting of Flemish elders and preachers, held at Leiden, 18-23 June, presided over by Tieleman Jansz van Braght, in which a number of church regulations were made and a strict attitude was stipulated against Galenus Abrahamsz and his followers. And after the Lammerenkrijg the Leiden Flemish congregations took the side of the Zonists. On 13 February 1701 it merged with the Waterlander congregation. At this time the conservative views seem to have disappeared, since in the stipulations of the union a clause is found in the formula of "benodiging" (invitation to the Lord's Supper) which is rather liberal, also admitting non-members to the communion service. The Flemish meetinghouse in the Boogaardsteeg was sold in 1726. There is more detailed information about the history of the Waterlander congregation, always numbering a larger membership than the Flemish,. In the early 17th century it was usually called "Duitsche en Walsche Gemeente," i.e., Dutch and Walloon congregation. It is not clear whether there was an independent Walloon (French-speaking) Waterlander congregation at Leiden; a document of 1613 was signed in French by Jean (Jan) de Mortier as bishop of the congregation of the "Valons" at Leiden, by Jan des Mulliers as preacher, and by Joost Cesaer as deacon. Possibly the French-speaking did not form an independent church, but met separately as long as the French-speaking refugees did not understand the Dutch language. There is a nearly complete list of elders, preachers, and deacons of the Leiden Waterlander congregation from 1613. Figures about the number of members are not available, except those of 1675, when the number of baptized members was 165. After that year there was a considerable decrease of membership. Most members were rather well-to-do, as is proved from legacies made to the congregation. In 1630 one of the members, Gerrit van Hoogmade, a deacon, founded an old people's home, the "Hofje" called Bethlehem. This institution, located on the Levendaal, consisted of 16 small houses facing a court, in which the inmates had separate residences. These houses and also the old gate of 1631 were still standing in 1957. The congregation was represented in 1647 at the large Waterlander meeting at Amsterdam. Since 1638 it had its meetinghouse in the Pieterskerkstraat, which, though totally rebuilt, was still in use by the Leiden congregation. From 1675 the congregation, which had joined the Lamist conference of South Holland, insisted on thorough training of ministers. When the Waterlander and Flemish congregations had merged in 1701, the total membership numbered about 300. The hoped-for growth expected from the union was not realized. In 1737 the membership was 201, in 1799, 105, and in 1847 only 43. From then on there was a considerable increase: 115 in 1861, 455 in 1902, 442 in 1934, 500 in 1955. The two old people's homes, De Hoeksteen and Bethlehem, were merged and in 1811 the Bethlehem house was sold. The Hoeksteen-hofje was henceforth called Bethlehem. Formerly the church board was supreme in governing the church. From 1701 until about 1914 only two congregational meetings (in 1810 and 1882) were held in which the brethren of the congregation were called to give advice to the church board. The preachers were chosen by the church board, while the board, assisted by the "Groote Kerkeraad," was self-perpetuating. 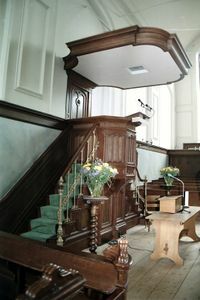 In 1774 a pipe organ was built in the meetinghouse, one of the first in a Dutch Mennonite church. In 1859 the meetinghouse was completely rebuilt. In 1752 the congregation took over the care of the property of the dissolved Mennonite congregation of The Hague, administering it and caring for Mennonites living at The Hague until a new congregation was formed there in 1882. Pastor Sepp of Leiden, who had given catechetical instruction at The Hague from October 1879, also preached from then until the new congregation called its own pastor in 1883. From 1777-1787 Francois Adriaan van der Kemp was preacher at Leiden. By his patriotic sympathies and his aversion to nonresistance he caused some dissension in the congregation. He was followed by Jan Kops (1788-1800), Jan van Geuns (1789-1814), Abr. de Vries (1801-1803), Matthijs Siegenbeek (at the same time professor at the University of Leiden) (1804-1829), Isaac Molenaar (1814-1818), Anthony Doyer Thz. (1818-53), Christiaan Sepp (1854-82), Aemilius W. Wybrands (1882-86), Salvus Kutsch Lojenga (1887-1904), W. J. Kuhler (1905-1912), J. Wuite (1912-1925), L. Bonga (1926-1934), F. ten Cate (1935-1943), A. J. Snaayer (1944-1954), and S. L. Verheus from 1955. The members of the Leiden congregations were found in the city of Leiden and surrounding towns Oegstgeest, Leiderdorp, Voorschoten, Katwijk, Noordwijk, Sassenhetm, Rijnsburg, and Alphen aan de Rijn. Church activities in the 1950s included a ladies' circle, young members group, Sunday school for children. The Leiden church has four large silver communion cups from 1705 and three pewter communion pitchers from about 1750. Dit Boec wort genoemt: Het Offer des Herren, om het inhout van sommighe opgheofferde kinderen Godts . . . N.p., 1570: 195, 526, 578. Cate, Steven Blaupot ten. Geschiedenis der Doopsgezinden in Holland, Zeeland, Utrecht en Gelderland, 2 vols. Amsterdam: P.N. van Kampen, 1847: Passim, see Index. Doopsgezinde Bijdragen (1875): 27-31; (1876): 62; (1892): 103-127; (1896): 60 f., 71; (1900): 15-19; (1907): 114, 116-120, 128-33; (1917): 149; (1918): 49, 53f. Hege, Christian and Christian Neff. Mennonitisches Lexikon, 4 vols. Frankfurt & Weierhof: Hege; Karlsruhe: Schneider, 1913-1967: v. II, 634. Hoop Scheffer, Jacob Gijsbert de. Inventaris der Archiefstukken berustende bij de Vereenigde Doopsgezinde Gemeente to Amsterdam, 2 vols. Amsterdam: Uitgegeven en ten geschenke aangeboden door den Kerkeraad dier Gemeente, 1883-1884: I, Nos. 82, 104, 162, 257, 261, 269, 288, 372, 613, 708, 781, 827, 907, 1081, 1126, 1415, 1562; II, Nos. 2048-72; II, 2, Nos. 253-58. Knappert, L. De opkomst van het Protestantisme in eene Noord-Nederlandsche stad, 1908, passim; f.
Mellink, Albert F. De Wederdopers in de noordelijke Nederlanden 1531-1544. Groningen: J.B. Wolters, 1954: 186-207. Poole, L. G. le, Bijdragen tot de kermis van het Kerkelijk leven onder de Doopsgezinden te Leiden. Leiden, 1905. Verhaat van 't gene verliandelt ende besloten is in de Byeenkomste tot Leyden. Amsterdam, 1661. Zijpp, Nanne van der. "Leiden (Zuid-Holland, Netherlands)." Global Anabaptist Mennonite Encyclopedia Online. 1955. Web. 23 Apr 2019. http://gameo.org/index.php?title=Leiden_(Zuid-Holland,_Netherlands)&oldid=126128. Zijpp, Nanne van der. (1955). Leiden (Zuid-Holland, Netherlands). Global Anabaptist Mennonite Encyclopedia Online. Retrieved 23 April 2019, from http://gameo.org/index.php?title=Leiden_(Zuid-Holland,_Netherlands)&oldid=126128. Adapted by permission of Herald Press, Harrisonburg, Virginia, from Mennonite Encyclopedia, Vol. 3, pp. 316-317. All rights reserved.